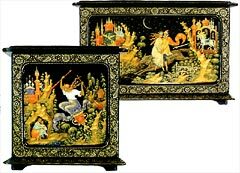 There are four schools of Russian lacquered miniatures art: Fedoskino, Palekh, Kholui and Mstera. Actually, Fedoskino was the first Russian art school that adopted the style of oriental «lakwear». Artists of Fedoskino use oil-painting. This is the most sufficient distinction. The Fedoskino miniature is realistic. The three-layer painting technique used in Fedoskino provides depth and volume of the works. The painting look real and alive and you can almost breathe the air of landscapes and subject stages. Palekh, Mstera and Kholui use egg tempera technique of painting. The point is that these villages have initially been icon-painting centers. In Palekh the icons "for the rich" were produced with use of triple nine gold, finest painting and very detailed development of all objects. Mstera and Kholui icons were produced for the middle class. 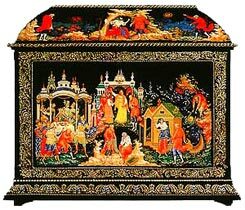 People, animals and landscape elements are stylized and preserved the icon style in this boxes, though the subject changed. Then the item has to be painted. Very often painter himself offers a sketch of the item, proceeding from the idea of the miniature as far as its form is a part of the created image. Before painting the artist prepares paints and gold. Every painter makes it himself. For preparation of egg tempera, a fresh egg yolk is taken, then the yolk is carefully punctured content is usually poured into an eggshell some water with vinegar is added, and then different dyestuff is supplemented into this mixture. 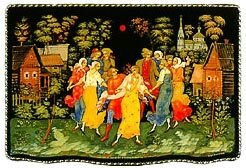 Egg tempera is usually prepared for not more than 3 days. At the beginning, the artist: paint with whiting, making the whole composition. Already at this stage they lay down the foundation of the colour decision of the miniature. They put several layers of whiting on the places which will have clear tones. Then the colour is added. This stage is called «Roskrish”. Then the painting is started. All outlines and details are painted with a dark tone, and all shady and light parts of the composition are revealed. This process is called «Priplavka». The last stage is a final dressing of displayed objects. It is done by «blanking», i.e. by lines which are applied in definite system in three tones in accordance to «Roskrish», painting and shades of «Priplavka». In Palekh miniature painting it is important to use «Plavi» technique, a skill to combine data and to be able to use «blank» painting technique. «Plavi» technique is a multiplayer painting where bottom layers are seen through upper layers, modeling the form and adding a live elasticity to the picture. There are four main types of the «blanks»: blanks by «Ikonop» (with specks and straight dash-lines), «bristle» (consists of thin golden lines), blank with paint - one of the oldest, which is applied in three tones, and very original and nice «feather» blank by which folds of the clothes are usually made. 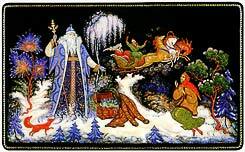 And painting is finished with tinsel and «silver». Instead of silver aluminium is used, which can be polished well. Painters «make gold» from gold leaf. It is clear that every painter has his own secret. They put 2 grams of gum arabic into a saucer and add a few drops of water, everything is mixed by a forefinger, until homogeneous adhesive paste is achieved and then with the same forefinger they take gold leaf and put it into the saucer. With vertical up and down movements they divide it into small particles which little by little get absorbed in the adhesive paste. This procedure has to be extremely careful, only vertical movement should be executed, otherwise gold may become sticky into small lumps. Then they ground gold for 1,5 hours, add some water, 2 grams of gum arabic and «make» gold again. After that they add 1/3 glass of water into the mixture and let it settle for 20 minutes. After 20 minutes water is poured off and gold dried being kept above a lamp. The whole procedure should be executed in conditions of exceptional neatness. The lack or excess of gum arabic not only prevents making gold but adversely affects the process of painting with gold. The given «formula» of gold making is practically tested and is optimal. After applying gold on the painting it is polished with a tooth of a wild animal, usually wolf or wild boar or by agate. For painting artists use six brushes of different size. For gold painting the thinnest brush is used. First it is dipped into water and then into gold. For aluminium and bronze painting (it is usually a powder) a longer and more careful grinding for several hours is necessary. Mostly the procedure is the same as in «gold making». Methods of gold and silver painting are different in the system of laying of lines and dash-lines for final exposition of forms and decoration of all elements of the composition and also for decoration of the item with ornament. The ornament in Palekh miniature is in harmony with the content, rhythm, and decorative order of the miniature and presents its final element. 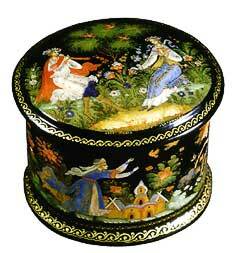 For Palekh miniature gold is not only a key element of the painting, but also a part of artistic perception. From ancient times gold personified sunlight, bright side of life. In Christian Era gold in arts was considered a material incarnation of the Divine light. Gold painting technique in Palekh miniature adds the picture the ennobling nature. 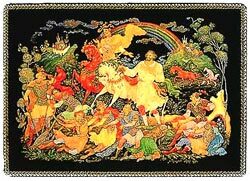 In combination with the black color of the subject forming a part of the color-range of the miniature it creates conditional space, cosmic infinity, connects earthy and cosmic, material and spiritual aspects. This is a feature of the Palekh art. Any motif acquires temporal, deep sound. As a piece of advice for beginners, a genuine Palekh and Mstera piece must have at least two distinctive features. First, the gold touchup lines (probeli), lines emphasizing the volume of the objects in the painting. A painter must have high skill to apply gold touchup lines properly; not all Palekh masters can do it. On a fake painting the gold lines are haphazard. Some fakers try to ornate the painting with lines bearing no construction sense, with the result that the ornament looks quite incongruous. Another thing, which may give a faker away, is his inability to use the technique of multi-layer brushwork (plavi). The technique is needed so sophisticated that painters who graduated from the Palekh art school take many years to master it. Unfortunately, an innocent buyer may not see the difference between real multi-layer brushwork and primitive coloring. 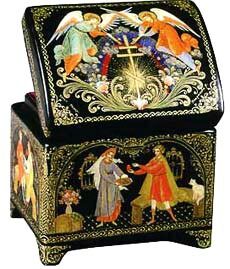 Here we are not talking about other more sophisticated attributes, which differ original box from fake. But we can mention them: a special technique in painting the naked places of people body (legs, arms, faces), special proportions of figures, special rules of painting mounts, trees, other floral objects. Every professional expert knows nearly each painter in Palekh and knows the unrepeatable style of all their works - so he can see the masterpiece and compare the signature of the painter with the style of current work and if it is certain difference - he tell for sure - This is fake! After having some experience of collecting and looking at the real ones, if you have a good eye for the beauty – you’ll got it yourself, before that - trust the respectful sources not the street vendors. Therefore, if a box costs less than $ 80 you'd better watch out. N.Borounov. 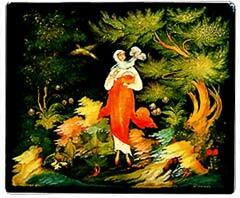 "The little humpbacked horse" Palekh. Box. 1971. A.Kochupalov. "Fisherman and the Fish Tale"